Many sources of information about Shoulder Tendonitis speak about Shoulder Bursitis and Rotator Cuff Tendonitis as essentially the same issue. That’s like saying that an apple and an orange are essentially the same kind of fruit. Tendonitis is when a tendon has wear and tear injury and/or Inflammation. Shoulder Bursitis is when a Bursa (a fluid filled bag that acts as a lubricating surface for a muscle/tendon to move over bone) gets irritated, then gets Inflammation. Depending on the circumstances, these two issues can show up individually or together. If you have Bursitis, then you have a Tendonitis dynamic. A. Overexertion of the rotator cuff muscles that hold the arm up and out at your side and lift it over your head. B. Too much friction, and too much weight on the moving parts (the burst) where the tendon slides over and moves with the Bursa, creates irritation. Tendonitis may or may not be playing a role. Make sure what understand what tendonitis is and how it works, and you'll understand how your shoulder bursitis developed. The factors that cause Tendonitis are the same factors that cause Bursitis. As I said above, if you have Bursitis, you have a Tendonitis dynamic. Inflammation, which causes the bursa to fill with fluid, quickly becomes problematic, in that now every movement causes a little more irritation (if not damage. Then the nervous system gets afraid, so it kicks in more inflammation, which traps more fluid and releases chemical which enhances your sensitivity to pain. Even before you felt pain, there was a Pain Causing Dynamic in place. If you get an injury in your foot, it hurts and gets VERY swollen around the injury. Then you try moving your toes, or even worse, walk on that foot. Same thing with an inflamed bursa, minus the puncture. It is swollen, inflamed, angry, and incredibly sensitive. Plus everything else in the area is being compressed as well as the bursa swells from the inside and muscles tighten down around it from the outside. This compressing dynamic can be part of the development of Shoulder Impingement Syndrome. What is Shoulder Bursitis? Simply put, it is having pain in your shoulder from having an irritated, inflamed bursa. This was caused by overexertion trauma centered on the bursa. The result can be some pretty severe symptoms. Depending on how long you’ve had an irritated bursa and how inflamed it is, symptoms can be mild to severe. * SEVERE pain, especially with movement. * ESPECIALLY with reaching the arm over the head. * Constant pain, even when you sleep at night. * The more you move your arm/shoulder, the more pain you have. Bursitis is one of the few instances times where I recommend absolute lack of motion for the arm as a beneficial solution. Unfortunately, immobility leads to its own set of problems around pain and injury. So you need to immobilize the arm/shoulder, but also regularly keep it moving just a little tiny bit so every little muscle gets some shortness and length. This is important for various reasons. It’s a balance you will have to figure out for yourself. Primarily, until the pain is nearly gone, you want to avoid ANY further irritation of the bursa. If you have shoulder pain but there’s nothing wrong with your bursa, then you don’t have bursitis. Shoulder pain can be caused by several other type of shoulder injury with very similar symptoms. Shoulder Tendonitis, for instance, can have very, very similar symptoms. The main difference being Shoulder Bursitis pain can IMMOBILIZE your shoulder due to excruciating pain. Shoulder Tendonitis can cause severe pain and limited mobility, but bursitis is pain on an entirely different level. Shoulder Bursitis is distinctive in that the pain is generally more severe, more constant, and very much immediately increased by the action of raising one’s arm over one’s head. Acute Bursitis pain can cause you to NOT be able to move your arm at all without blinding pain. Remember I said that if you have bursitis of the shoulder then you have a tendonitis dynamic? The factors that cause Tendonitis cause Bursitis. Do what I suggest you do and your bursitis will go away. Do know that, due to the nature and physical make up of a bursa, it will take a bit longer to fully get the bursa back to normal. But you can expect a reliable decrease in pain along the way. If your doctor hasn't been able to get rid of your shoulder bursa pain, if the shots and splints and rest haven't worked, and especially if the surgeon wants to cut into (causing more injury), you might want to learn some effective self care to get your shoulder back on track. 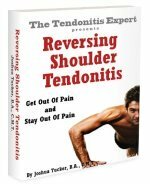 Reversing Shoulder Tendonitis shows you how to reverse your shoulder bursitis. Return to the top of this Shoulder Bursitis page. Go to the Shoulder Tendonitis page.